It has been a while since I used raspberries in a recipe – not because I haven’t been buying raspberries, but because I’ve been unable to resist eating them right out of their box when I get them home! A bag of frozen raspberries is what it took to get me to break the cycle. Frozen raspberries are great for baking because they are just as flavorful as their fresh counterparts, but they hold their shape and are much easier to incorporate into the batters for cakes and muffins. 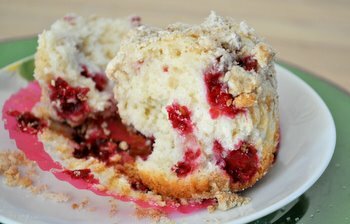 These Raspberry Streusel Muffins are a fantastic recipe for raspberry fans. The moist, tender muffins are bursting with brightly colored and brightly flavored berries. 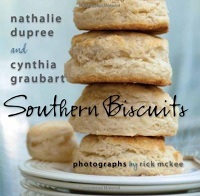 In fact, they’re so pretty that it is almost difficult to take that first bite (but not impossible!). The muffins are topped with a generous topping of sweet streusel, which adds a little texture and a nice extra sweetness to the muffins. The streusel mixture is very fine, but by squeezing it together in your hand, you can make big clumps of streusel that look and taste delicious – and are easier to apply to the top of your un-baked muffins. That said, don’t worry if the streusel gets a little messy when you’re putting it on top of the muffins. It will stick as the muffins bake. These muffins could also be made with blueberries or blackberries, if you’re looking for a little variety in your muffins, but sweet-tart raspberries are hard to beat. The muffin batter has a small amount of vanilla and almond extracts, both of which work very well with the raspberries. 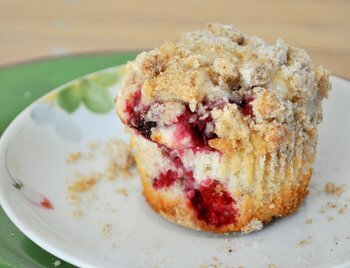 There is also a bit of ginger in the streusel, which doesn’t dominate the flavor of the muffin or the berries as cinnamon can, although adding ground cinnamon to the topping is not a bad idea either! Preheat oven to 350F. 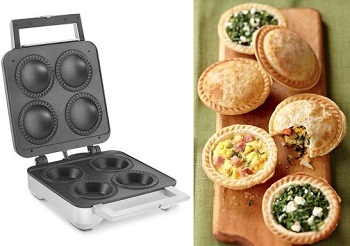 Line a standard muffin tin with 12 paper liners. In a small bowl, make the streusel. Stir together all dry ingredients, then cut the butter into small pieces and add to flour mixture. Rub in butter thoroughly until mixture is very fine and sandy. Pick up the streusel mixture and squeeze it in your hand to form small clumps, repeating until streusel appears to have a much coarser texture. Set aside. Next, make the muffin batter. In a medium bowl, whisk together flour, baking powder and salt. In a large bowl, stir together melted butter, sugar and egg until well combined. Stir in half the flour mixture, followed by the buttermilk, vanilla and almond extracts. Stir in remaining flour mixture, mixing just until the dry ingredients are incorporated and no streaks of flour remain. Fold in raspberries (toss frozen berries in 2 tsp of flour to keep them from “bleeding” into the muffin batter). Bake for 20-23 minutes, or until a toothpick inserted into the center of a muffin comes out with only a few moist crumbs attached. Turn muffins out onto a wire rack to cool completely. Cooled muffins can be stored in an airtight container. *Note: If using fresh berries, you may need to reduce the baking time by 1-2 minutes. I love the idea of the crumbly streusel on top, it’d probably make a nice and healthier change from the usual lashings of frosting I usually use! Ooh, I’ve been looking for a fruit-inspired recipe to take into work next week, and this might be it! Do you think this could be adapted into a 9×9 bar-type dessert? These look delicious! I love anything with that amazing streusel texture. These look fantastic and I love the color you get from the raspberries. I’d love them with any berry variation! I ate my blueberries last week before they made it into my muffins. I did not have a bag in the freezer. These look incredible and I love the streusel top. YUM! I’ve already tried a few raspberry muffin recipes (all of them with chocolate, dark or white) but the results were not what I expected. Even Alice Medrich’s recipe for raspberry and dark chocolate muffins disappointed me. Your muffins, on the other hand, look amazing, Nic – and streusel toppings are one of my weaknesses! Bookmarking the recipe right now! Oh yes! I can relate to eating them right out of the box as soon as I get home! These muffins look so good! Just popped these babies in the oven at 8pm 😉 they look awesome! I’m sure they will taste just as fabulous. Thank you so much for sharing. My 2 boys will have a yummy surprise in the morning. I have made these muffins twice this week. The first time I followed the recipe, the second time I flipped the amounts of the extracts around. I love anything almond flavored, so I did 1 tsp almond extract and 1/4 tsp vanilla extract. Perfect!! I will never do another muffin recipe. I am in love with these. I’m going to get some more raspberries today to have on hand. Thanks for a great recipe!